EPISODE 8 Can I REALLY learn to love fruit and veg? In this Thursday Therapy episode, Glenn Mackintosh shows you how to try new fruits and vegies, incorporate them into your diet, and even learn to LOVE them! 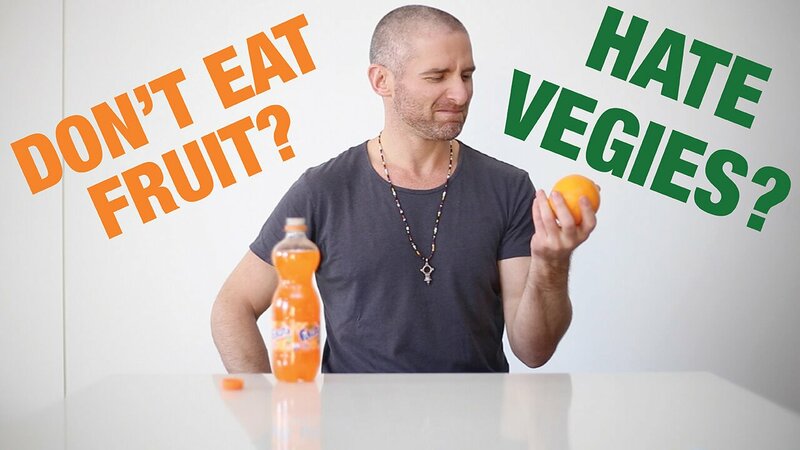 (This video is especially good for people who don’t like fruits and vegetables). Know someone who could eat more fruit and or veg? SHARE THE VIDEO!!! Hi everyone, the question we’re answering today is, “I didn’t really like fruits and veg, how do I incorporate it into my diet?” Welcome to Thursday Therapy. Great question we have about how to incorporate more fruits and veggies. I love this question because research tells us that just by focusing more on eating fruits and more on eating veggies we tend to eat less of the other stuff it’s not so good for us and I think it’s always good for us to have a positive focus and focus on what we are doing, rather than focusing on what we’re not doing. So, Emma asks, “I’m quite limited on the fruit and veg I eat as I’m quite fussy, but would love to try more food in my diet. What’s the best way to introduce foods that I’m not too familiar with or may never have tried before?” Excellent question Emma, thank you for asking. Look, incorporating new fruits and veggies is a bit of a tricky little task, so first thing I don’t want you to beat yourself up too much and if you have digestion issues like IBS or you have food intolerance or you’re extremely fussy, you may want to get some support from a dietitian or a nutritionist. Guys one thing that I want to promote in Thursday Therapy is interdisciplinary care and so we’re I can’t help you as the psychologist, I’m going to refer you on to people who can help you, but even if you don’t have any of these issues, it can be tricky, so I want us to work through over the next couple of weeks maybe until our next session and have a go with a few ideas. I’m going to give you a few ideas and I want you to have a play around have an experiment and I’m sure that at least one or two of them will be really useful for you. Okay the first answer is really simple. To get better at eating the foods you have to eat the foods, now this is not a novel idea but it’s a very workable idea and it requires a bit of discomfort because you’ve got to start to eat foods that your taste buds might not love but what I want you to do is try this for a couple of weeks because between now and next Thursday Therapy, you’ll have completely new taste buds; we get completely new taste buds around every ten days to two weeks, so by the time I see you next, you have completely new taste buds and if you start eating more of this stuff and more of this stuff your taste buds are going to start to forget they like this stuff and this stuff and naturally you’re going to crave these foods. To help you get through, I’m going to encourage you to do something that I almost never encourage you to do, if it’s really hard and you really don’t like the new flavours, the bitterness, the subtleties of flavours, the tartness, the texture, I’m going to encourage you to actually eat mindlessly, so you might distract yourself with the television or distract yourself with a phone or distract yourself in any other way and actually practice some mindless eating for a period of time, so your brain doesn’t get too focused on those senses but the first idea is to get good at eating, you just eat those foods. Okay, the next idea is I want you to experiment with different ways of preparing your food. So, you could experiment with different cooking methods, for example often if you don’t like the bitter tastes of certain vegetables cooking them more can reduce the bitterness and enhance a subtle sense of sweetness. Sometimes you might like to add spices and those spices can mask certain flavours or enhance certain flavours, for example; I never thought I would say this, but this cauliflower is one of the most amazing things you would ever taste in your life, apparently it has turmeric in it, I don’t know what turmeric is, apparently, it’s a spice but whatever it is, it makes it taste bloody delicious. You can experiment with lots of different cooking methods you can incorporate your veggies into foods that you normally eat like, for example grating carrot into meatballs and you don’t even really notice that it’s there. You can even start off really, really small and incorporate little bits and then continue to incorporate more over time. So, I just want you to experiment with a lot of different ways of cooking these foods, preparing these foods and combining these foods, so that are most palatable to you and I’m sure that that experimentation is going to come up with some great results. Okay, guys, the third thing that you might want to try to help you to eat more fruit and veg, is to reduce your processed food. Processed food does a lot of yucky stuff but two things I want to draw your attention to; firstly, processed food creates these gross approximations of the natural flavours found in real food. So, for example, if we take this orange there are probably hundreds of flavour molecules and various subtleties of flavour in the orange. If we take an orange drink, they might take the five or six main molecules that we taste, take out all the other ones, because they’re too expensive to create, and just pump it full of those main flavours, so you end up getting this like steroidal avatar of what a natural food tastes like. So, if you’re drinking a lot of processed drinks or eating a lot of processed foods it actually becomes very challenging to enjoy the natural flavours that are associated with real food. So, if we have a bit less of this or maybe a lot less of this, it’s going to be much easier for us to appreciate this. The other thing the processed food does is of course it adds a lot of sugar. So, if we’ve got this quintriple dose of sugar from foods like this, it makes it very difficult when that’s floating around in our brain, floating around in our taste buds for us to appreciate the subtleties of flavour that might be found in, say, the pumpkin or the pomegranate. So, if you are to be able to, in a way that’s right for you, reduce these processed foods, then you’re going to find that naturally it is much easier for you to appreciate the flavours, the subtlety of flavours in these natural foods. Guys, before we finish up, what I want to do is give a quick shout-out to the Australian College of weight management. Sonya Bella and her team there are doing a wonderful job of creating weight management consultants. I had the pleasure of teaching these guys about it year ago and I’ve got to say they were unbelievable. I think, that as allied health professionals, we become a bit elitist and we think that the dietitian is better than the naturopath, we think that the psychologist is more effective than the counsellor, we think that the exercise physiologist always does a better job than the PT and what I’ve got to say is that I’ve taught doctors, dieticians, psychologists, exercise physiologists and the level of discussion and the questioning and the energy when I taught the students and ex-students, from the Australian College of Weight Management, was second to none, so well done guys you are doing an absolutely great job and as always guys we all know someone who they could do it eating a bit more fruit or a bit more veggies. So, if you know someone like that maybe just give them a gentle nudge and forward on this Thursday Therapy, they might go, “Right, oh” but then watch it and get something out of it and of course if you haven’t already, please subscribe to Thursday Therapy. That’s like booking you in for our next session and I’ll see you in two weeks. Hey Buddy!, I found this information for you: "EPISODE 8 Can I REALLY learn to love fruit and veg?". Here is the website link: https://www.weightmanagementpsychology.com.au/episode-8/. Thank you.